While browsing CincyChic one day, I came across the information for the Red Pink and Blue fashion show. Red Pink and Blue was developed by Candace of Art of the Spa to raise awareness and educate women about common women’s health issues–specifically heart health (red), breast health (pink), and diabetes (blue). A fashion show, you say? I’m there! Fellow blogger Tina of Florida Girl Meets the Midwest and I decided to hit the event together. Amy, the Editor-in-Chief of Cincy Chic, was kind enough (and adorable in her long pink dress and matching earrings) to give us a behind-the-scenes tour! After plying us with some tasty pomegranate vino (thanks Amy! ), Amy led us over to the gorgeous silver jewelry glinting in the sunlight at Lisa Robin Jewelry. I spoke to Lisa for a bit about her background in management and marketing consulting and experience in interior design, which means she’s got both the business and creative sides covered. Believe it or not, Lisa’s signature design was inspired by a door she saw in Florence while on a trip to Italy last year! The combination of classic patterns forged in silver and accented with pale semi-precious stones gives off a subtly alluring medieval princess-meets-wood nymph vibe. I’m already picturing multi-layered necklaces and bracelets worn with thigh high boots and clouds of lavender chiffon for fall. Think Isabel Marant meets Princess Aurora. While we were standing there chatting, Amy introduced us to Jamie, a breast cancer survivor who would be modeling a custom-made dress in the show’s finale. Jamie owns Fusion Studio, a fitness and personal training studio in Newport and Jamie is buff. Seriously, I sucked in my stomach and silently vowed to do more push-ups after we talked about her amazing story (she was pregnant when she was diagnosed) of strength and survival. We moved on to the makeup counter where the ladies from Saks were handing certificates for free consultations. I need to do that stat–I’ve promised myself that I’d learn out how to properly wear red lipstick without looking like a cracked-out circus clown. We moved on to the “dressing room” where all of the models were hanging out and spoke to Amy Maynard of Soho, the local boutique providing the looks for the show. The shop itself has been around for 12 years, but former IT Consultant and restaurant manager Amy has only owned Soho for three months. It’s actually a great story: she was in the shop trying to find an outfit to wear to the Chelsea Handler show, and overheard the former owner lamenting about selling the boutique. 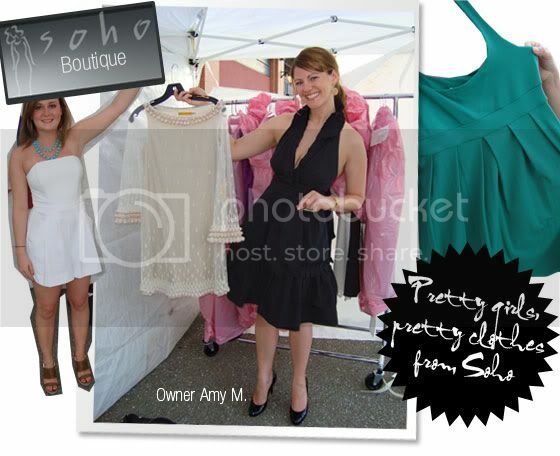 Amy immediately decided that she would buy Soho! She promptly put down the dress she was trying on and bought the entire shop instead! How cool is that? Tina and I have already made plans to commandeer the boutique for a welcome-to-the-hood shopping party. I’ll keep you updated. Do you need some more coochy? Tina wanted to stop by the Pure Romance booth to say hi to Tisa, and the big “private dancer pole” box on the table caught my eye. Hmmmm…it is supposed to be good exercise (I heard)! Tisa is funny and friendly and chatted us up about everything from pole dancing to her hometown in Florida. Wide-eyed and open-mouthed, I gaped at Tina, trying not to panic. What? You can get more? How do you know you’re running out in the first place? How low is my supply? Finally, we headed over to the Purple People Bridge and sat down to watch the fashion show at the end of what has to be one of the best outdoor runways ever. As the models sashayed down the looong catwalk (they were wearing heels, poor things!) we pointed out the pieces we liked and I tried to take pictures, but it was dark and the lighting on the bridge wasn’t really photo friendly. There were some really cute -pieces, though–I can definitely see wearing the black jumpsuit with an armful of bangles and dramatic gold earrings, hair pulled back in an assymetrical bun and a slash of deep coral lipstick. Very 80’s YSL. ETA: I just found out that the custom-made caftans the survivors wore are available on eBay! After the show ended, we thanked Amy and met the darling Linda, the editor of Cincy Chic. There was an after party for the event at Havana Martini, but we were too pooped to attend. However, I will be there for the Past & Present fashion show coming up at the end of July! Big thanks to everyone who participated in the show and supported not one, but three worthy causes! Like this post? Subscribe to the RSS feed, or subscribe by email and get new posts sent directly to your inbox! What an amazing and humbling experience!! You are too cute. Love the photos. I had a great time and look forward to another one. 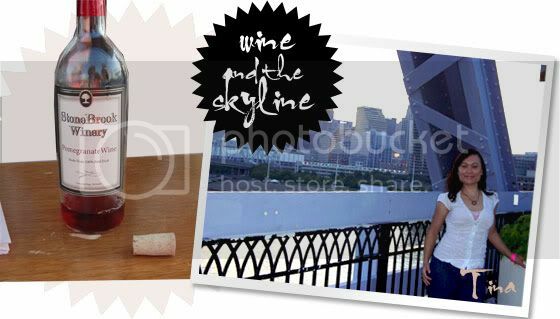 Great blog!..I can’t believe your in cincy! lol I’m from cincy now living in Portland Or..it’s great to see such a fashionable sista in the nati!…where do u get your hair cut the shape is great,I had a Natural Hair salon when I lived there and clients still call me for recommendations!